This is an item liked by every one in our house, especially by my eldest son, who prefers to eat it daily even! 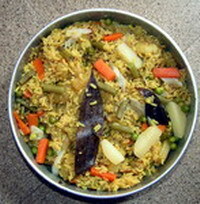 It has various avatars like masAla bAth, mixed vegetables rice, vegetable pulAv, kalavai rice etc. All the vegetables duly washed and cut into 1 inch size should be taken to measure 2 cups including the green peas. * Always use triple refined oil with less fat preferably rice bran, corn or cotton seed oil. Roast cinnamon, cloves and cardamom in a kadAi, powder and keep aside. Wash the rice and soak it for 10 minutes in 2 ½ cups of water in which about 1 tsp salt is dissolved. Take the oil in the kadAi. When it becomes hot add cumin seeds and the bay leaves. When the seeds splutter, add onion, cut into medium sized pieces. Lower the flame. Now grind ginger, green chillies and garlic into paste in a mixie and sauté along with the cumin seeds and bay leaf in the kadAi till the raw smell leaves. Add all the vegetable pieces, turmeric powder and salt to this and sauté for 5 to 10 minutes. Strain the water from the rice and keep it aside adding the rice only to the contents in the kadAi. Again, sauté all of these for 5 minutes. Add the strained water and allow the rice vegetable mixture to boil for 5 minutes. Now transfer everything to a vessel and pressure cook them till you hear 3 whistles. Put off the flame and wait till the pressure comes down. Now remove the cooked contents and add clarified butter along with the powdered spices. Mix well. BiryAni is ready! This goes well with Pachchadi, appaLam and chips. Onion pachchadi is better than the tomato one. 1. If you want it to be spicier, you can add garam masAla powder (¼ tsp). Cut onion and green chillies into very thin and small pieces. Mix them along with the salt in the curd. Sautee the mustard and add to this after it splutters. Mix well. 1. Those who do not like the raw smell of onion may sauté it with the chillies along with the spluttered mustard for just a second and add to the curd with salt and mix. 2. Basmati rice with long grain is suitable. 3. If you use only one of the above vegetables, it becomes the bath of that vegetable. I do not waste ladies finger and kundru (ivy gourd) when they become old but use them to prepare their bath in this way. 01. 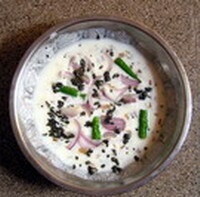 We use onions in making pachchadi for mixed vegetable and other baths. Normally in the hotels, they slice it into very large pieces and use in raw form giving a very very poor taste. I always sauté before using it for pachchadi and that too with onions cut into small pieces. If you are averse to onion in pachchadi and find it to be too sharp in taste, wash the pieces well before use as well as add a dash of salt and a pinch of pepper or cumin powder to enrich it further. However, I prefer the pachchadi without pepper or cumin powder. 02. Never use the knives forcibly to chop anything as it would make them blunt faster. Use always a wooden board to chop gently but not on plastic board or any stone slab. If the plastic board is of bad quality, along with the vegetable you may be eating plastic shreds also. 03. When you add ½ a tsp of sugar to greens, peas, cauliflower and other coloured vegetables while cooking, they do not lose their original colours. In the case of potatoes, while frying if you add a pinch of sugar, the pieces will fry faster and crispy. This entry was posted on February 24, 2011 at 9:45 am and is filed under Vegetable BiryAni with tags appalam, basmati, bay leaf, beans, beet root, biryani, capsicum, cardamom, carrot, cauliflower, chips, cinnamon, clarified butter, clove, Corn oil, Cotton seed oil, cumin, curd, garlic, ghee, ginger, green chillies, green peas, kadai, kalavai sadham, masala bath, mixed vegetable rice, onion, pachchadi, par boiled rice, potato, raita, raw rice, refined oil, rice bran oil, salt, saute, spices, turmeric, vegetable bath, Vegetable briyani, vegetable pulav, wok. You can follow any responses to this entry through the RSS 2.0 feed. Both comments and pings are currently closed. Wow…what a telepathy !!!! Its masala bath for lunch today amma 🙂 & the first line of this post is 100% TRUE. Like minds always do likewise! Facts like the first line will continue for specific items when they appear here!